Just a quick post today before I head off to bed. Today's mani was inspired from a couple of tutorials I saw in some of the blogs I follow. It involves the use of fishnet. If you are the one who posted the tutorial or know who did, please let me know in the comments so I can add a link for everyone to check it out. So basically what I did was paint my nails with a layer of Claire's funky/fabulous. 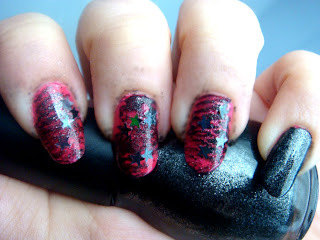 Then using Sinful Color's Secret Admirer I covered some nails totally with it and for the rest I painted a piece of my fishnet tights that I cut off with the polish and just pressed it on the nails, producing the effect you see. Alas the tights were of course stretchy so it came out a bit messy, but I rather like it after all. 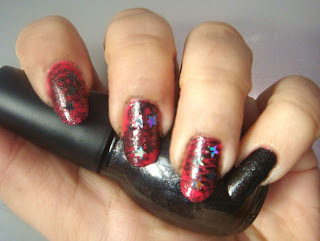 Then I added a few black star spangles, topped everything with Seche and here is the finished result. And with this I will head to bed. :) I like this a lot. It's a very interesting way to do nails! I’m excited to announce OPI’s 100,000 Fan Giveaway, where winners have the chance to score 6 currently retired lacquer shades! Helping OPI reach 100,000 “Likes” on Facebook by December 31st will open the vault for 100 lucky fans to receive some of OPI’s hottest hues from the past. Please check out my blog for more details! Messy or not, it's amazing!If you find the tutorial do post, or even better, do one yourself! Thanks everyone. I am glad you liked this look even though my fingers looked so messy. I am considering a tutorial as I cannot seem to locate the original posts where I saw this.